Is there anyone else out there that remembers this toy? I had one of these in the mid '70s when I was a kid and absolutely loved it. It was the closest a budding horror fiend like little Yukon could get to creating his own horror make-up. The bag contains all the prosthetics and various hair pieces, eyeglasses, etc that would be glued on with a glue-stick. They could be pulled off again but the downde was that Hugo got gunky and grungy pretty damn quick. I recently learned that Hugo was created by Alan Ormsby the year after he wrote, directed, and split make-up effects work with Tom Savini (his first film work) on Deranged. I found this one on feebay in brand-new condition and just had to snag it! 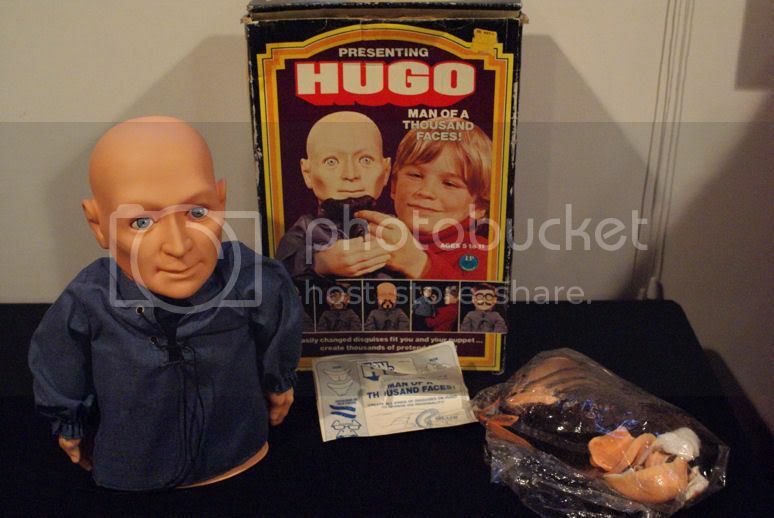 Along with this mint Hugo, the guy threw in a used Hugo with the parts in a ziplock bag and a spare used Hugo head. I actually had one of those, and still had it in the attic of my mom's house untill she moved and we trashed a bunch of my childhood treasures several years ago. well rub it in why dont you!!!!!!!!! !